The Goddess Kali is worshipped in Hinduism as a ferocious manifestation of Parvati, an incarnation of the Devi or Mother Goddess. She is the Divine Mother, Goddess of Destruction, Conqueror of Time, and Triple Goddess of creation, preservation, and destruction. She is a Destroyer of Demons. Kali is fearsome in appearance. She has wild eyes, a protruding tongue, and she wields a bloody sword. Kali holds the severed head of a demon, and she wears a belt of severed heads. Kali is described in the Devi-Mahatmyam (also known as the Chandi or the Durgasaptasati) from the Markandey Purana written between 300-600 CE, where she is said to have emanated from the brow of the goddess Durga (slayer of demons) during one of the battles between the divine and anti-divine forces. 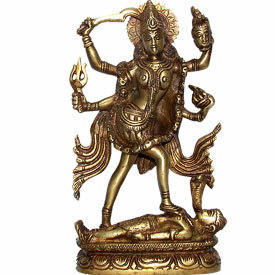 Kali is considered the 'forceful' form of the great goddess Durga. The unleashed form of Kali often becomes wild and uncontrollable. According to legend, only Shiva is able to tame Kali, a version of one of his consorts. 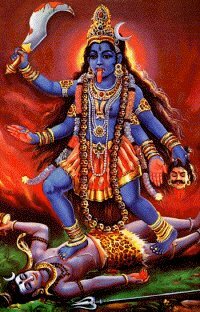 Shiva tames Kali by challenging her to the wild tandava dance and outdoing her, or appearing as a crying infant and appealing to her maternal instincts. While Shiva is said to be able to tame her, the iconography often presents her dancing on his fallen body, and there are accounts of the two of them dancing together, and driving each other to such wildness that the world comes close to unravelling. Here is one story of the manifestation of Kali: "The Gods were not able to kill the demon, Raktabija. Each drop of his blood that touched the ground turned into another Raktabija. Thus, every time he was struck, millions of his duplicates appeared all over the battlefield." "At this point the Gods were totally desperate, and they then turned to Shiva for help. Shiva, though, was so deep in meditation that he could not be reached. The Gods then turned to Shiva's consort Parvati for help. The Goddess Parvati immediately set out to do battle with the demon, and it was then that She took the form of Kali." "Kali then appeared, with Her red eyes, dark complexion, gaunt features, hair unbound, and Her teeth as sharp as fangs. She rode into the midst of the battle on a lion, and it was only then that the demon Raktabija first began to experience fear." "Kali then ordered the Gods to attack Raktabija, while she spread Her tongue over the battlefield, covering it completely, and preventing even one drop of the demon's blood from falling. In doing this, Kali revented Raktabija from reproducing himself again, and the Gods were then victorious." I like the blog. And now am going to recommend a book (on rec from an indian former boyfriendish person) before I went to India that gave me a nutshell understanding of the country: Arrow of the Blue-Skinned God: Retracing the Ramayana Through India by Jonah Blank. Written to entertain and concise enough that I learned a great deal. Pas - MUCH appreciated. I will check it out. Thanks for the tip! She has wild eyes, a protruding tongue, and she wields a bloody sword. While I realize that it's not your intention to describe my cat that I had while growing up, change the word "sword" to "claw" and you've decsribed her to a tee. Did I mention that her name was Calley?!! lol to myself on this one.